This blog evolved from my own growing understanding of social class and stereotypes. I had started to realize people stereotyped community colleges as sort of a "2nd class" education. I knew from attending and working at a community college (and being able to compare it my incredible small private undergraduate institution and my Big Ten public graduate school institution) that this was so very far from the truth (hence the blog's tagline in the banner above). And the truth is, there are incredible community college students transferring to Ivy League institutions every year. One such student is Chris Wilbur, a graduate of Bristol Community College and current student at Brown University. He is also a non-traditional student, as he didn't enter community college right after high school. I know Chris personally as he is also a Jack Kent Cooke Undergraduate Transfer Scholar and one of the most fascinating and helpful people I know. Since Chris is such a great writer, I wanted to share his journey in his own words below. His story explains how he started at Bristol Community College, what led him to apply to an Ivy League, what obstacles he faced in that process, what it was like to transfer to an Ivy League, and some great advice about how to manage your transfer experience, no matter where you go. 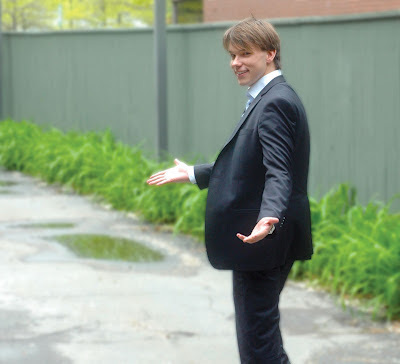 "The years between 2009 and 2011 were some of the most industrious and gratifying years of my life. I entered Bristol Community College with an assortment of experiences, but not much direction and a lot of anxious curiosity of where my future would take me. I really found the riches in the institution when I started engaging as a tutor in ESL; I realized how much I enjoyed contributing. I decided for the next two years, I would give everything I had to Bristol Community College. It was the best decision I ever made. From coordinating civic engagement activities, to writing for the newspaper, and from running for student elected office, to working with Congress, I found that contributing to the cause enriched me enormously. I found that power comes from empowering and hard work leads to large payoffs. I eventually gratuated valedictorian and was able to transfer to my dream institution. It wasn’t a solitary effort though. Helping others, I learned, leads to a community of mutual assistance. Being helpful can come in a number of forms. 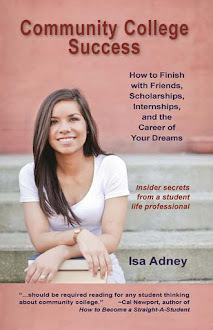 As Isa articulately outlines in her book, simply being prepared to deal with college administration can be very helpful. Courteousness and a smile can enrich their day. They will be much more willing to help when interactions are pleasant. I found that respecting the work that college personal engage in daily, and offering enthusiastic assistance whenever possible, wins points and friends. Without cultivating such relationships with numerous employee groups, I would never have had the opportunity to transfer as well as I did. I set up appointments with career counselors, transfer affairs professionals, professors, directors and other administrators, and from this network I gathered the information and confidence that comes from able individuals who are interested in your success, and was able to search out colleges fitting for me. I applied to twelve colleges in all, from little liberal arts schools, to sprawling state schools. I rigorously researched their programs and their uniquely nuanced educational philosophies. When narrowing down those that fit within my scope of interests and characteristics, I endeavored to tour campuses and speak to admissions officials. I am convinced this is what led to acceptance by some colleges, and lack thereof by others. By tailoring an admissions letter to the strengths and quirks of a school, you are letting the admissions officer know that you are a good fit for the school, and by making an effort to communicate and show up on campus, you send the message that you are enthusiastic and ambitious enough to succeed. This held true in practice for me. Among other excellent institutions that worked out for me, Brown stood out as ideal. It had an open curriculum, allowing students to personalize course selection to their interests. It had a class shopping period where students sample classes for two weeks, and pick the ones they want to take. And it had the feel of a small liberal arts college, with the global reach of a mega-university. Of course, my life-long desire to attend this particular school was not lightly weighed into the equation. But beyond a doubt, community college enabled me to enter. Ok, here come the adjustments and obstacles. There are numerous distinctions between a community college and elite university. One is the admissions policy: community colleges are open and elite schools are highly selective. At Brown, nearly 50% are valedictorians, often from selective preparatory institutions. This means if you had been the most animated and knowledgeable in class, you have competition. If you were comfortable in coursework pace, get ready. And if you came from a less than cushy economic background like myself, be prepared to meet students that have had resources concentrated on them their entire life. This is not necessarily a bad thing, however. You will be pushed to be on your game in class and to compose a new and articulate lexicon for class discussion. Also, suddenly, you will find yourself surrounded by some of the most brilliant people you have ever met and the possibility for incredibly stimulating conversation is omnipresent. Another distinction is age variety, or lack thereof. At Brown, well over 90% are traditional age. This poses a bit of a problem for jumping into conversation about all the latest pop events and last night party experiences. For the latter, this is a bubble I am presently penetrating (I hope), and for the former, I have found a few ways to circumvent this. Starting a discussion on a presentation that just ended will nearly always be well received. There are also are non-pop bonds that I have found quickly attaching. For example, one of my best relationships started over a scooter. One student had one, and I was thinking of buying one. This filled the first few conversations we had, which eventually led to us grabbing a meal together after each class. Most students have been enrolled at Brown since their freshman year. For transfers, the transition is a bit awkward mid-college experience. However there is usually a cohort of transfer students with similar experiences, and I found reaching out to them was rewarding. Freshmen are also in a similar state of frenzy. Everything is new and they are struggling to fit in. I found attending orientation events based on effective time management skills, study habits, speed reading, etc. were exceptionally helpful, especially because they were predominately attended by freshmen. Taking introductory courses the first semester is also helpful. And finally there is the work. Here is a bit of advice: take the first semester as lightly as possible. Select basic classes, focus on school work, connect with friends when possible but don’t dwell on the difference between community college and your new institution. I did, and suffered for it. At BCC I was successful, connected. I was comfortable and on top of my game. The semester at Brown was a shock. I invested all the time I formerly spent on student engagement and leadership activities (which was practically all my non-academic time), on course work, and still came up short. The transition was unnerving and on top of this, I was uncomfortable that I was unable to uphold the level of student engagement I had previously enjoyed. I finally realized my expectations were misaligned. In retrospect, the best bit of advice would be, don’t hold yourself to your old standards. Do your best, never do less, but at first, focus all efforts on doing well in school and feeling comfortable in your environment. Compare yourself to yourself, and not your peers, and not your previous performance in community college. Coming to grips with the disparity in environments is essential to growing to meet the new challenge in positive terms. And in time, you will find that once comfortable, you will unfurl like a flower, and be able to engage in new activities (and see a bump in your GPA). My unfurling wasn’t until late spring semester. So I leave you with the Jack Kent Cooke Foundation slogan (which is a great scholarship I encourage all to apply to): 'think big, work hard, achieve.' And if at first you don’t succeed... try try again!" Like this blog? Check out the book! !